Don't get all depressed over a guy from the past.That's like getting sad because the garbage man picked up the trash. Let him go, he's not worth your tears, he's not worth your pain, he's not worth the worrrying, he's not worth fighting for. He hurt you and broke you, let him go. If he really loved you and wanted to stay, he would've. But if hes dumb enough to let you go, let him walk away. In the end he will remeber what he lost and regret what he did. Until then move on and be HAPPY. In 2013, He broke my heart. In 2014, He will be just a memory. I'm through with sentimental quotes, I'm through with sad goodbyes, I'm through with all the pain he gave me. I just hope I'll be through with him so everything won't be a big lie. It hurts. I will not lie. The nights are hard and lonely sometimes. But, the future is ahead. He is in your past and that is where he belongs. 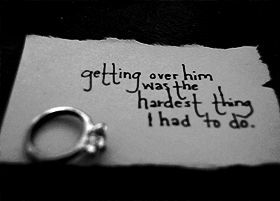 Getting over him may be a very difficult task to accomplish. Not only will you miss his warmth when he hugs you, and his strength when he holds you, but you may also miss things like the way he used to look at you, and all of the fun times that you experienced with him. These memories might stay with you for a long time, but if you really want to get over him you have to be as proactive in it as possible. In order to start the process of getting over him you must first change your thinking. Do things to keep your mind occupied in order to not think about your recent break up. Partaking in activities that you enjoy, spending time with your friends, and even trying to seek new hobbies out will help you keep your mind off him. Also, spend this time alone to work on yourself, and to develop yourself into an even greater person than you already are.